The Explainer is where we explain an aspect of Chinese life. Simple. So now you know. Happy Chinese New Year, folks! It's that time of year again, when red envelopes – also known as 红包 (hongbao), 'red packets' or even 'lucky money' – holding a monetary value are given to and received from friends and families. Hongbao, of course, aren't just limited to Spring Festival. They can be gifted at weddings, graduations, birthday parties (especially those for children or senior citizens), after the birth of a child or as a work bonus. 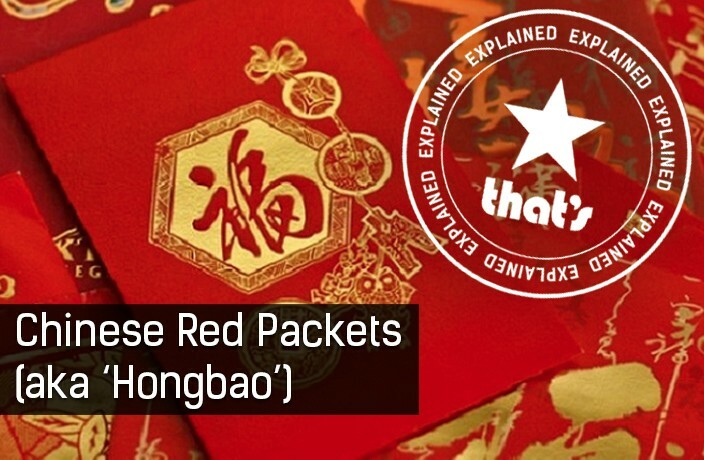 Here we explain the legend behind the red packets, who gets them, giving/receiving etiquette and WeChat hongbao. According to the myth, a monster named Sui came around with intentions to harm children on the night of New Year's Eve. It was said that the children were so terrified of the demon that they couldn't even cry or yelp. Instead, they would come down with a terrible fever which eventually led to mental instability. To prevent Sui from coming to harm the children, parents would light candles and pray in the nighttime. These prayers were very sincere, so the gods granted them eight guards that were disguised as coins to protect them. People then started to thread eight coins along red strings and place them underneath the children's pillows. Soon, it became an annual tradition. Sui was warded off by these protective symbols and eventually stopped scaring children altogether. So why are the envelopes called 压岁钱, 'ya sui qian'? The character 岁 (sui) actually has the exact same pronunciation as 祟 (sui), the monster's name. These coins were called 压岁钱 (ya sui qian), meaning 'lucky money to ward off evil spirits.' As generations passed, coins were replaced with notes and the thread was eventually replaced with an envelope. The amount of money inside isn't really what is important, though. The real signifiance is found in the cherry-red paper that the envelopes are made of, which gives all the good vibes. So sending red packets shows that you want to pass off good luck, happiness and your blessings to others. When you are receiving a red envelope, make sure that the giver is not present when you open it, otherwise it could be seen as impolite. Who Receives Red Envelopes and How Much Should You Give? If you have started to make an income, well then now is your time to start giving out hongbao. A general rule is that with the more income you earn, the more value should be added to the envelopes. Married? Well, then you're in luck in some places, as there is no need for you to give red envelopes, according to customs. In fact, at your wedding, you should expect to receive lots of hongbao from guests. Your parents and grandparents will also probably still keep giving you these packets to show their love and blessings. Again, lucky you! (However, in other regions, you are supposed to start giving out hongbao the first Spring Festival after your marriage). What about children? According to old tradition, money should be given to kids who start to make their own money. For your own children, you should gift anywhere from RMB100 to whatever amount your heart desires. And for nephews, nieces and children of your friends and colleagues, RMB50-200 is considered an appropriate amount. Greetings of happiness and good health can go along with the packets. The elderly should receive money from their kids as a sign of gratefulness for everything they have done. This amount should range from RMB300-2,000. Finally, for special occasions like weddings, birthday parties and graduations, expect to give anywhere from RMB200-1,000, though that figure differs between cities and provinces. If you're unsure how much to give, consider gifting an even number and always avoid the number four (more on that below). For an elderly person's birthday, RMB200-500 is considered an appropriate amount. Some tips on giving and receiving hongbao. 1. Never give wrinkled, old, or dirty bills. You want to make sure they are crisp and clean, but get these notes in advance, there can be long line-ups for bill exchanges leading up the Chinese New Year holiday. Avoid putting coins in the envelopes. Bills, bills, bills! 3. Avoid giving unlucky amounts of cash. Anything that starts with a four (i.e. RMB40 or RMB400) is a no-no, as it's considered a symbol of death. Even numbers are also preferred over odd, besides the number four of course. If you want to share extra good luck, give denominations that start with an eight, for example RMB800. Check here for more on appropriate amounts. 4. Always be prepared to give out envelopes at any given time. Put together your envelopes in advance, just in case you meet people you know randomly, and make sure you have enough to cover the whole span of the holiday. You never know when you might run into someone you know (and they might have kids), so you'll always want to be prepared. But the amount here doesn't have to be anything hectic, and anything from RMB10-50 should suffice. Keep up to RMB100 if you're feeling extra giving. 5. Carefully mark your envelopes to keep track of who gets what. Put different amounts in differently designed envelopes, so that you know which ones you are giving out. Otherwise you may find yourself accidentally swapping the RMB100 one for the RMB1,000 one... awkward! 1. Use two hands to receive your envelope. In many Asian countries, two hands to receive something shows proper manners. 2. Don't open the hongbao in front of the gifter. Ensure that you don't open the envelope in front of the person who gave it to you. As we mentioned earlier, this is very impolite. When you receive one of these red guys, express thanks and wish your friend or family member a happy New Year (or any other greeting relevant to the occasion). You can simply say, 'Zhu ni xin nian kuai le' (祝你新年快乐), which means "Wishing you a happy new year!" Check out some popular greetings here. If you want to get fancy, there are other ones more specific to the Year of the Pig. If you want to be snappy and don't have a lot of time on your hands, there's a great way for you to to send virtual hongbao over WeChat. You can send it to individual users or in group chats, and even add a nice message if you want as well. With these tips, we hope that everyone's holiday will be packed with happiness and good fortune. Happy Lucky Money giving! For more of The Explainer, click here. This article was originally published on January 18, 2017. It has been updated and republished on February 2, 2019. Whip up favorites like mapo tofu, kungpao chicken and ginger beef like a pro with this English-language cookbook. Want to make your favorite Chinese dishes at home but not sure where to begin? Try these three cook books. Looking to bring some authentic gifts back from China but not sure where to start? These books will help. Here are five essential English-language books to give you a full introduction to the world of Chinese tea. From Chinese characters to local cuisine, here are 10 must-have English-language books to help you better understand Middle Kingdom culture.